The preview bulletin for Weekly Famitsu magazine confirms that this Thursday's issue will include another article about the upcoming game. We can expect new details about chapter eight, which is confirmed to be the Osaka Winter Siege, and the secret backstory chapters related to it. We'll find out more about the 'Sanadamaru' fortress and its incredible destructive power, and Sarutobi Sasuke will also be involved. Finally, we're promised additional DLC information. 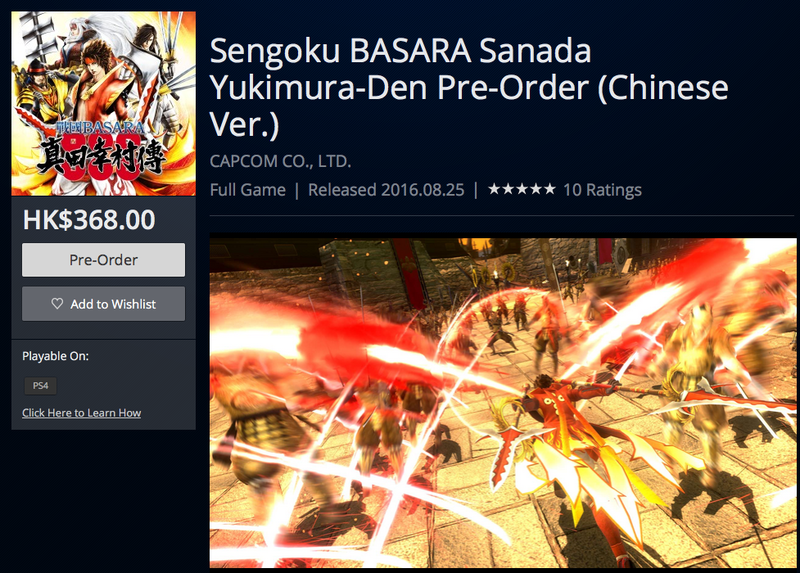 The Chinese version of Sengoku Basara: Sanada Yukimura-den is already available for preorder from the Asian PlayStation Stores. It's RM190 in the Malaysian store and HK$368 in Hong Kong. Preloading will commence up to two days before the release date on 25th August 2016. Customers who preorder will receive a PS4 custom theme and the 'White Cross' preorder-exclusive costume for Yukimura. I expect to see the Japanese version appearing on the store later this week combined with press releases from various gaming websites. Capcom's marketing team have been ensuring the game pops up in all kinds of unexpected places lately, from a feature about what modern businessmen can learn from the Sanada clan on Lifehacker Japan to a candid article about what makes the Sanada men so popular with women on Rocket News. 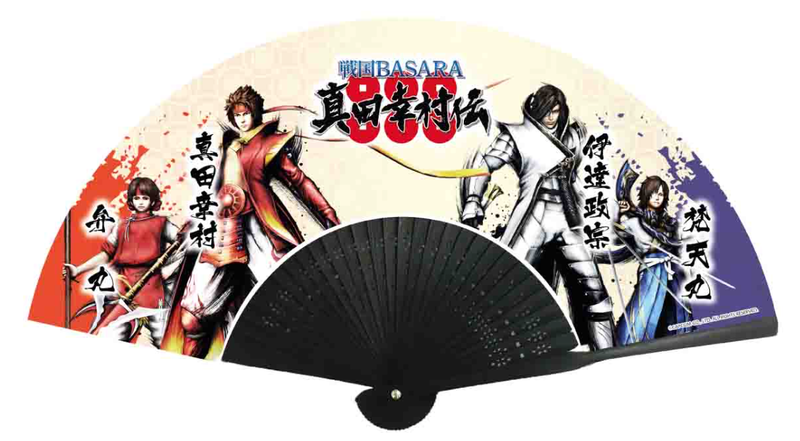 As with Sengoku Basara 4 Sumeragi, Capcom has posted an offer for fan reviewers. From all of those who sign up before 8th August 2016, thirty people will be selected to receive an advance copy of Sengoku Basara: Sanada Yukimura-den on the understanding that they'll test it ahead of the release date and send their detailed impressions back to Capcom. The three best feedback reports will earn the reviewers a mention on My Capcom and priority for future review campaigns. The past two weekend in-store events have revealed new weapon skins. 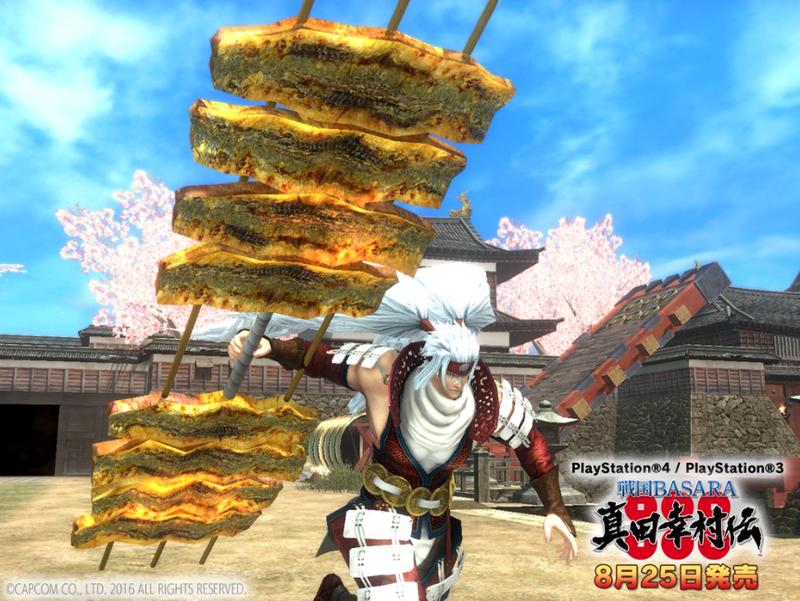 Last week's was Oushuu Speciality: Beef Skewers, which transforms his six blades into chunks of seasoned meat. Beef tongue in particular is very famously associated with Masamune's homeland of Sendai. And more recently, Nobuyuki's special weapon Doyou No Ushi was shown. It's shaped like grilled eel because in the real world, it's auspicious to eat eel on the day of the ox, Doyou No Ushi. Used book specialist Furuhon Ichiba will be making some additional merchandise available alongside Sengoku Basara: Sanada Yukimura-den when it's released in a few weeks. 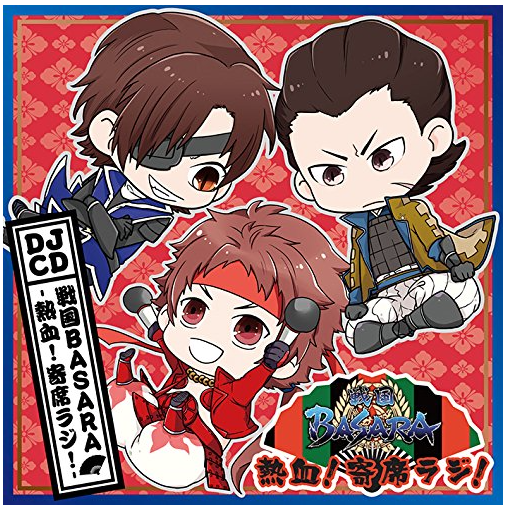 The coloured version of the cover illustration for the new DJCD: Sengoku Basara -Nekketsu! Yose Raji- release I mentioned previously has now been added to various shop listings. It's certainly cute! The latest chapter of Sengoku Basara: DOKUGAN led to a few tweets which revealed that the Uesugi clan made their post-apocalyptic fantasy debut in chapter seven of the crazy new manga. Even more interestingly, the artist chose to depict Kenshin without any headwear (and actually using kanji). I can't wait to pick the manga up in due course and find out exactly what's been going on. 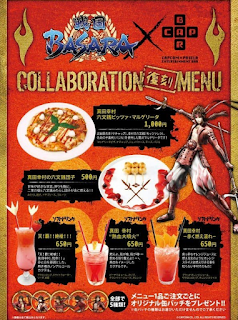 Visitors to the Capcom Bar in Tokyo will be able to enjoy a Yukimura-themed menu until 10th August 2016! If you've ever wanted to have an entire meal made of nothing but Yukimura-related food items, this could be your best chance. The first episode of a new web series featuring Capcom TV's space pirate Gor☆geous was posted recently. The purpose of the show is for the presenter to learn about Sengoku Basara: Sanada Yukimura-den and share his discoveries with viewers. The first episode is about Gor☆geous being approached by NonakaP out of the blue and being dragged off to try the game out. He's made to play through the first ten Sanada Trials missions as Yukimura under the producer's watchful eye as a challenge - and fails. Episode 2 (released on 5th August 2016) will cover the Sanada family's fighting styles, Episode 3 (10th August 2016) will examine the game's references to real-life history, and Episode 4 (19th August 2016) will force Gor☆geous to show NonakaP the results of his studies as the finale of the series. Speaking of Capcom TV, the next episode (3rd August 2016 at 20:00 Japan time) will be including more footage from Sengoku Basara: Sanada Yukimura-den. They plan to feature the 'Sanada Blood' character-swapping mechanic and show Katsuie's secret backstory chapter from the main story. Series director Yamamoto Makoto has suddenly burst back onto the scene in a big way after being absent for a while, and he's the face of a new series of behind-the-scenes documentaries titled The Action Of Sanada Yukimura-den. YamamotoD is accompanied by motion capture actor Koga Wataru, and the two of them discuss the challenges of creating the game's outlandish moves with human actors. Koga is a veteran, having collaborated on the series with YamamotoD ever since Sengoku Basara 2 Eiyuu Gaiden (HEROES). There's an interview page to go with the videos here - you can scroll through the videos with the left/right arrows to see some more pictures. Text is available for seven clips even though only three have been posted so far, so I guess we can expect accompanying videos about Nobuyuki, Masayuki, Benmaru and Bontenmaru before too long. Koga is a fan of the games. Every time he's told about something new they plan to do, he's both fascinated and worried about how difficult it's going to be to put the motion together. When they're coming up with new movesets, Koga tries out the weapon ideas YamamotoD comes up with then later they have to select a suitable actor to perform the motion capture and bring out the character's personality properly. Tanaka Hiroto performs the motion capture for both Masamune and Bontenmaru. This game is actually his debut, though despite being young he's already claimed the accolade of Best Stuntman in the Japan Action Awards for his work in GARO -GOLD STORM- Shou. They talked about how tough it was paring the roster down to the tiny all-male group of six main characters (they sounded sad about it). If there had been any female leads they'd have relied on the actress who provides the motion capture for the female characters in the series, Hosokawa Toni. Yukimura's motion capture actor, Sugihara Akira, yells a lot during his performances. Since the equipment only records the actors who are wearing the motion capture devices, they use helpers (who are effectively invisible) to hold the actors up in some of the more outlandish poses. This is the fourth set of Masamune's six claws they have built. The stunt weapons take a lot of punishment in the studio. YamamotoD praised Sakon's motion actor Kambe Yutaka for his skill at pulling off Sakon's spins. Since Rikyuu's moves have a dancelike quality, Koga picked out a dancer who had also worked as a stuntman to perform his motion capture. When it comes to refining the characters' gestures in motion, they've incorporated a few things they noticed in the stage play series into the games. Masamune will be present at Osaka in Sanada Yukimura-den. It's implied that the Sanada Trials are unlockable since the interview mentions that the classic versions of Yukimura and Masamune become available over the course of play, but it might just be a poor choice of words. The reason that Nobuyuki's spear resembles a ladder is that some of the armour the real-life Sanada clan members used bore a ladder emblem (like the one on Masayuki's clothing). YamamotoD wanted to have Nobuyuki wielding a spear like the other Sanada clan members, but he also wanted to incorporate the ladder idea. Nobuyuki's motion is provided by Wada Keiichi, who handles quite a few of the more 'powerful' characters. YamamotoD has heard that the real-life Masayuki wasn't as great a person as historical accounts claim - some people considered him a fraud. He was brilliant tactically yet he had the reputation of being sneaky. Obviously this contributed to his portrayal as a flashy magician in Sengoku Basara. Kawana Motoki does the motion capture for Masayuki, and also Matabee. They joked that he seemed to work on very 'unique' characters, though he also gets to act cool when providing the motion data for Kenshin. Bontenmaru's scarf has three trailing ends rather than the usual two to help convey the sensation of twirling. The reason there are three ends is specifically that the team thought someone like Masamune would be discontent with a normal scarf with only two ends. Benmaru's voice is noticeably more boyish than Bontenmaru's. Voice actor Nakai Kazuya originally tried to use a higher pitched voice for Bontenmaru; they deliberately asked him to lower it to give the impression that Bontenmaru was a little more grown up than Benmaru. The motion capture was planned the same way. The first clip is a general overview of how they create the motion capture and moves for the game. There are some production sketches detailing Yukimura's new moves on screen at one point, and they confirm that in the story he'll be using the Hinokaku ('Scarlet Horns') outfit for chapters two through to seven, the Kurenai ('Crimson') outfit for chapters eight and nine, and the flashy Fushichou ('Phoenix') outfit for chapter ten along with the avant-title and ending sequences. So Yukimura will have the three costumes we've already seen as his standard outfits. The video also shows that the controls are similar to previous games as expected (e.g. Basara moves triggered with Circle). 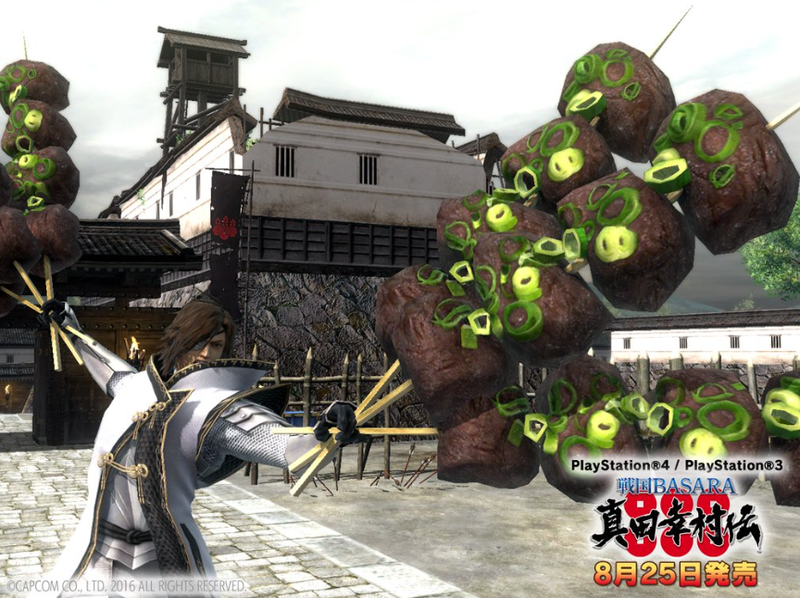 This is a rare opportunity to see behind-the-scenes content from the Sengoku Basara games! I'll be posting after Capcom TV and Weekly Famitsu reveal the latest tidbits tomorrow at some point. And at some point, I'll catch up on all of the comments! Sorry for the delay! Huh, the guy who does Kenshin's mocap does Matabee as well? Ironically interesting, haha. Also interesting one person does the mocap for all the women. Cut each others' hair...!!! @w@ ugh you're killing me here. ~<3 But yeah, the similarity is uncanny. It would be nice to see another behind the scenes thing for future games, definitely! Yey! I knew it! That Fushichou outfit will be in last chapter! But something still bothers me: who is then the last boss? Ieyasu or Masamune? Because in the third promotional video, we see Yukimura fighting against Masamune in his Kurenai outfit, and in his Fushichou outfit against a bunch of Tokugawa enemies... And without his Rokumonsen necklace!! I'm going to bet that Ieyasu is the last proper boss but at the end Masamune pops up again somehow. I hope they keep the last few chapters secret until the game comes out, because if they don't I won't be able to resist reading all about them! Indeed, in the website I have been nothing that the latest each chapter becomes, the less information they release about the story. They really don't want to ruin the surprises! That was fun and interesting to read! And see. I had no idea that they used motion capture even for the more crazy action moves. Now I’m wondering about the moves of the other characters. Like Sakon which they mentioned, and Tenkai’s ”I have no spine” moves. Perhaps also now that there are stage plays, they want to make sure that as crazy as the action is, it's still kinda almost possible to imitate. - Raindrops you totally deserve an early copy to review. - Eh is the guy in the Rocket News article trying to pick up women by wearing red like Yukimura… please don’t try to use his way of yelling to succeed!